Click the image at right to download the report. 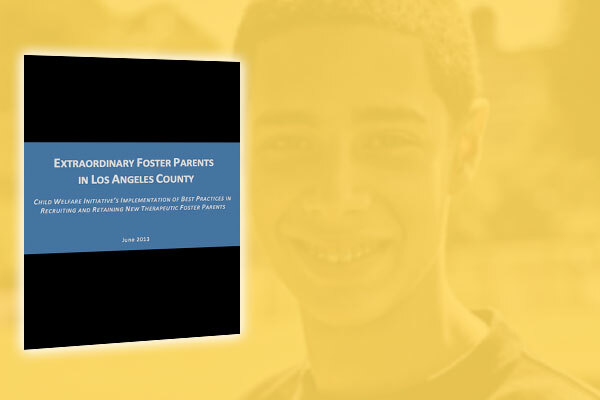 Los Angeles County has the nation’s largest child welfare system and cares for one of the largest populations of foster children with severe mental disabilities and behavioral disorders. Foster children with mental disabilities are among those children most likely to be harmed while in foster care and among those children who do most poorly after leaving foster care. Therapeutic foster homes allow children with mental disabilities to live with specialized trained foster parents and receive help that addresses children’s individual needs, rather than less effective and more expensive congregate care settings. At a minimum, 300 foster children in Los Angeles County need therapeutic foster care. Questions? Contact us for more information on this initiative. We need your help to continue our work helping connect foster youth with good families. There are many ways to help... with money, time and other resources.